If your job is to provide science-based nutrition – and sometimes lifestyle – advice to individuals, patients, schools, sport teams, health agencies, grocery stores, food manufacturers, or a myriad of any other individuals, businesses and governments who seek such services, you have been doing so with one hand tied behind your back. This is not the fault of any particular person, but a function of how the process of science is slow to provide truths or certainties about anything – much less what we should eat for optimal health. But that is all about to change. If you are a Registered Dietitian or Nutritional Consultant of any kind, participating in the American Gut project will give you a front row seat to the genomic science that’s changing the very notion of Self, what makes us sick, and potentially provide some insight into the diet and lifestyle choices that might nudge our gut microbes in a more healthy direction. All nutrition and lifestyle advice up until this point – mostly up until this point – has treated the individual as this mono genomic creature made up of genes handed down from mom and dad; with all nutrition and meal planning based on some institutional or national notion of a healthy and balanced diet with consideration given for age, gender, physical activity, disease state and so on. And in almost all cases (but not all), further emphasis is placed on the total amount of calories in the meal or the day. Fair enough. However, advances in genomic tools, computing power, and mounting evidence reveal that we may want to formulate nutritional and lifestyle strategies that acknowledge that 99.9% of the genes (and 90% of the cells) that make up the human body are not human, but microbial. As for that 800-pound gorilla in the room – obesity? Maybe 2013 will be the year we finally start treating this metabolic disease and its roots in systemic inflammation, from the more correct perspective of physiology, with a little less emphasis on physics (energy in–energy out hypothesis). As patients and clients have done for over a decade, downloading and printing out diagnosis, theories and general information from the internet for points of discussion in meetings and consultations will continue, but with one striking difference in 2013: more of those print outs and discussions will be on the role of the gut microbiome (microbes and their genes) in obesity and just about every other ailment imaginable (some related, some not). The graph below (thanks @symbionticism) of Google searches for the word “microbiome” since 2007 suggest that this might already be happening. With the publishing of the results of the recently completed Human Microbiome Project in the summer of 2012, we have entered a period that will likely witness the creation and rise of an entire new field of medicine: medical ecology. Nutrition will most certainly likely sit at its core. Since the national examination administered by the Commission on Dietetic Registration does not currently require an understanding of the role of diet and nutrition in the modulation and health of the gut microbiome, the recently launched American Gut project might be a great first step in understanding the metagenomic tools and diet and lifestyle decisions that might be shaping the composition of the human gut. Any diet and nutrition specialist who takes advantage of this opportunity – not only to contribute to our larger understand through citizen science – will place themselves in a better position to understand the waterfall of new studies and research that has come and will be coming in 2013 an beyond. By having your own gut microbiota sequenced, you will possess the powerful tool of context in which to assist and guide the population as whole. We hope you can join us. *Please forward this post to others. Thank you. Next Post Can parasites prevent autoimmune diabetes? As a dietetic intern, I would love to sign up, but since I’m in a (mostly unpaid) internship, I don’t really have the money now. It’s definitely something I’m going to pay attention to when I am a RD though – I feel like most RDs have no idea about microbiome and its importance. Either the RD profession will change or– given how entrenched they are in Standard American Diet-thinking, more likely–they will be superseded by a new specialty–maybe called Registered Microbial Ecologists, who will help people manage their personal microbiome, and thereby their total health, through the foods they choose to eat. Much agreed! I’m a RD and there is nothing more interesting to me than our guts. A thorough understanding of the microbiome is necessary to provide accurate and helpful advise. I’m on board! Pingback: What’s in my gut? Let’s find out! | Ancestralize Me! This is fascinating stuff, but I have a new twist on the testing. Yes, I have Type 2 and metabolic syndrome over the past few years, and would love to sign up and send in a sample. But hands down, the most suffering I have ever experienced has come from severe dry eye syndrome. Millions of people now have this horrendous condition, and doctors really don’t have a clue why. So my question is: what about swabbing the eye lid margins (where the meibomian glands are) to see if there is some kind of bacterial/microbial thing going on that could be causing the problem? Can you tell me how I would properly swab this area, and could you test it if I sent in a sample? Thanks so much; you could be at the leading edge of solving this mystery and helping a whole lot of people live normal lives again. not sure an eye swab would be much help unless we had a large sample of other folks suffering from the same ailment – and folks who do not. Yes, I can appreciate your point. Can I encourage you to consider that at some future point for the millions of those who suffer from DES? Thanks so much! There is some evidence dry eyes may be cause by a lack of carbohydrates for those on a carb-restricted diet. This is quite a late reply, but there is a group in Houston, TX working on severe dry eye and Shogrin’s syndrome in relationship to the ocular microbiome. You can contact Joseph Petrosino at jpetrosi@bcm.edu (PI) and/or Diane Smith at dls1@bcm.edu (Grad student) if you’d like more information about where they are at with this study (I used to be part of that lab but recently moved on to a post-doctoral position elsewhere). I just discovered your web site and will add it to my bookmarks. I am an RD and have incorporated gut awareness and gut health principles into my practice for 30+. Many years ago I was very influenced by a book I read by a scientist who studied the diets and health of Africans. I can’t remember the author, but at the time, it was felt that fiber and bowel health was the key to overall health. Interesting that we are now learning of the underlying reasons! As a result of that reading early in my career, I have always included a bowel and medication history looking for antibiotic use. I am always stunned by the how few providers incorporate bowel pattern assessment into their practice! I have recommended high fiber diets and probiotics for years, even before the recent emergence of all the great science promoted here and elsewhere. The biggest frustration is the lack of support in the Western medical community AND perennial fad diet crazes, the latest being the low grain, high protein paleo craze. I hope all of the great information from your work is better promoted in the medical community as well as the RD community. I will continue to do my part, but it is lonely out here! I studied nutrition at Bastyr University 20 years ago and work as a Certified Nutritionist in Washington State. Thanks to PHD, RD, Buck Levin, who was way ahead of the curve, we learned about the importance of gut bacteria way back then, but had such limited information. 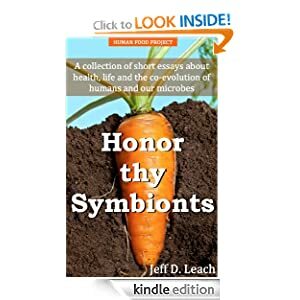 We knew that Vit K was produced by the gut bacteria, we knew about pro-biotics, and we suspected that fermented foods like tempeh and saurkrat were beneficial to the stool, as well as the benefit of substantially more fiber than the typical diet contains. I will be watching your website and am happy to join the project. This is the research that we Bastyr Nutritionists have been hoping for. Thank you, Thank you, Thank you for your work! sincerely, Annette Marsden M.S., C.N.